The deciduous Spindle shrub is a spreading shrub that will grow to around 4 m at the ten year point if left to its own devices. It could go on to grow twice that but this depends on local conditions. 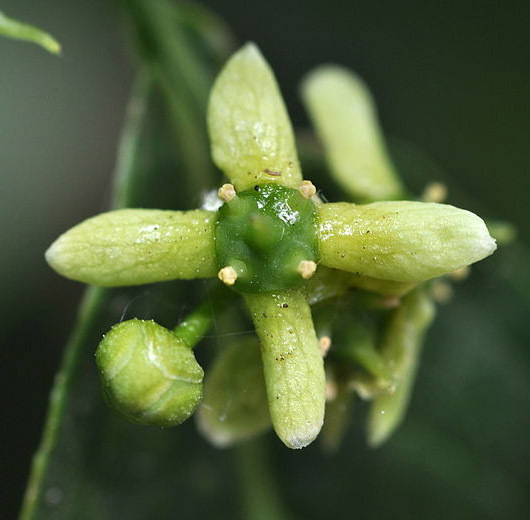 The dark green leaves will turn red to yellow in Autumn and the small yellow flowers will change to a 4 lobed fruit which break open to show orange seeds. These are considered poisonous to children/animals and remain long after leaf fall into the Winter. Often found in native hedgerows and considered likely to attract birds and other wildlife. A long lived tree/shrub with an expected life span of over 100 years. Apparently it can be found mostly in Europe on Forest edges, wild chalky areas, hedgerows and gentle slopes so if you have many acres of forest on a hill, next to a chalk quarry, in your suburban back garden then you are in luck. Failing that, plant where ever you like and cross your fingers which is widely considered to be an authorised form of gardening....in this office anyway. Euonymus Europeaus eventually forms an interesting and distinctive bark but only if you are into that sort of thing. If not then it will just be bark. Considered to a tree or shrub of average growth per year. Average is usually around 30-45 cm but do not hold us to that as we know there are some customers out there with a calendar and tape measure that like to hold us to these things. Spindle Shrub (Euonymus Europeaus) can be used as a hedging plant for hedges up to about 4m tall. Plant 3 per metre for a single line or 5 per metre is using the double staggered hedge method. Suitable for coastal positions and slightly wet sites. If you look out your window one day and you see you Spindle shrub wearing arm bands then you do not have a slightly wet site. Often found in ornamental parks because someone in authority said it was a good idea to plant Spindle. They were probably influenced by the bright colours from the fruits and flowers. Spindle Shrub (Euonymus Europeaus) can be host to Aphids so you do not want to plant these if you grow plants susceptible to these e.g. beans and beetroot. Considered to be fully UK hardy which means you can plant it in Scotland as it is resistant to frost and wind. Plant in full sun positions for best results although it will tolerate partial shade. The creamy white wood is somewhere between quite and very hard making it very useful for woodworking projects requiring quite to hard wood! These include items such as skewers, pegs, knitting needles and spindles (as the name suggests). Modern uses for Spindle wood include turning it into high quality charcoal for artistic purposes. Spindle Shrubs will tolerate Chalk, Clay, Sand and Loam (normal crumbly soil). For best results plant in well draining soil and keep it away from gardeners with a history of killing plants. Tip pruning in mid to late Spring will encourage bushy growth. No one has written a review for this tree/shrub yet, but if they did, we are confident it would mention the words amazing, brilliant, breath taking and beyond belief or at least it would contain those letters that made up those words and we could rearrange them to say it.